Glad to be here again in order to share my impressions and reflections on a recent fieldtrip to Northern Lapland (the summer part can be found here: https://arcticanthropology.org/2012/09/07/arctic-design-field-thoughts-and-questions/). This time it was a month-long travel between Finland, Sweden and Norway (as my Sami friends nicely say – the United States of Sápmi). Now looking backwards, I can even say that this trip was my most insightful fieldwork so far: it was full of unique ‘breathtaking moments of discovery’! It was a sincere fascination that came after a couple of days – fascination with people who can see the beauty of these surroundings, who do not just accept this environment, but also interact with it: by talking, reading the signs, getting relaxed, etc. This small piece of outfit contains a great variety of technologies that altogether facilitate a human performance in extreme environment. For now, let’s talk only about funny bent tips. They are well known as ski-hooks, but this one function is just a ‘tip of the iceberg’. In fact, this particular shape is incredibly perfect for keeping toes warm, because it constitutes an internal ‘extra-storage’ of warm air. Even though it might sound quite obvious, it can hardly be figured out and appreciated from looking at the shape, without trying it. When I did my spontaneous ‘field test’, the first impression was a deep astonishment: my feet were warm, and it was such an unusual feeling! It has never happened to me in winter before, I’m always freezing immediately after going out, in spite of any kind of fancy ‘hi-tech’ boots I have ever tried. This example is just yet another confirmation that ‘traditional technologies’ are far from being simple, primitive, and so on; also their implications cannot be grasped ‘in a glance’. The same about the hay filling: I tried myself several types of insoles and none of them worked as perfect as hay. Hey, Gore-tex and other hi-tech stuff, sorry to tell, but you failed! The real Arctic hi-tech has been born and developed ‘in situ’ thousands years ago, and our modern industry is still far away from this level. Another example relates to ways of using modern technology. I found out that local appropriation of snowmobiles among Sámi is nowadays a product of ‘beyond design’ thinking: the owners literally separate form and function by detaching the original fancy surface (the engine hood, for example) and replacing it with a handmade cover. The reason for such actions is simply practical: plastic parts are easy to damage during intensive and ‘inappropriate’ usage for reindeer herding. When the one-year guarantee is expired, the owner puts the original cover back, so it is easy to sell the machine and buy a new one, with more advanced technical characteristics. I do not mean, however, that in other places of Sápmi people are ‘less Sámi’: the form of expression is just different. I could compare it to a water flow: at some point it might be a plains river, a quiet lake, but here it’s a waterfall or a fountain… It should be something in the air of Kautokeino! Reblogged this on lumehelid, lumevärvid. These are amazing pictures again, and text beautifully composed to harmonise with them. The use of surface and angles in the landscape as well as the reindeer give in my view this special touch to the paintings. Tim Ingold’s “Lines” come to my mind here, and I think, after all maybe the world consists of more than lines: surfaces! But when you look at the paintings, of course we find loads of lines in them, which create movement, dynamics in the composition. Your comment about the shoes shows once again that lived experience is the key to understanding the world! No learning, studying, calculating, reasoning does that job for us. Only when we try these shoes we feel the meaning of that hook there even beyond its function as a ski-holder. I would never have come to the idea that this is an additional warm air storage, and I wonder if someone has interpreted it like that before. This leads me to the question of the role of the environment for design: where else can you study this as well as in the Arctic? Here it’s just impossible to forget the environmental imperative. There’s not a single day where you would not care how the weather is. It is dominant and influences our being and doing at any moment – unlike in more temperate climate. But how much do you think is design influenced by the environment? Look at the diversity of Arctic clothing design, for example. Ok it makes sense to me in terms of environment that in the tundra you find parkas with inbuilt hoody and gloves, like the Nenets Malitsa. You just can’t afford to leave any gap open exposed to the wind. In the forest you find separate hat, gloves and shorter coats, to enhance flexibility and movement. The forest protects you from the wind to some extent, but you need to turn around often, change direction while navigating between the trees. But this is just one obvious example, which does not explain e.g. 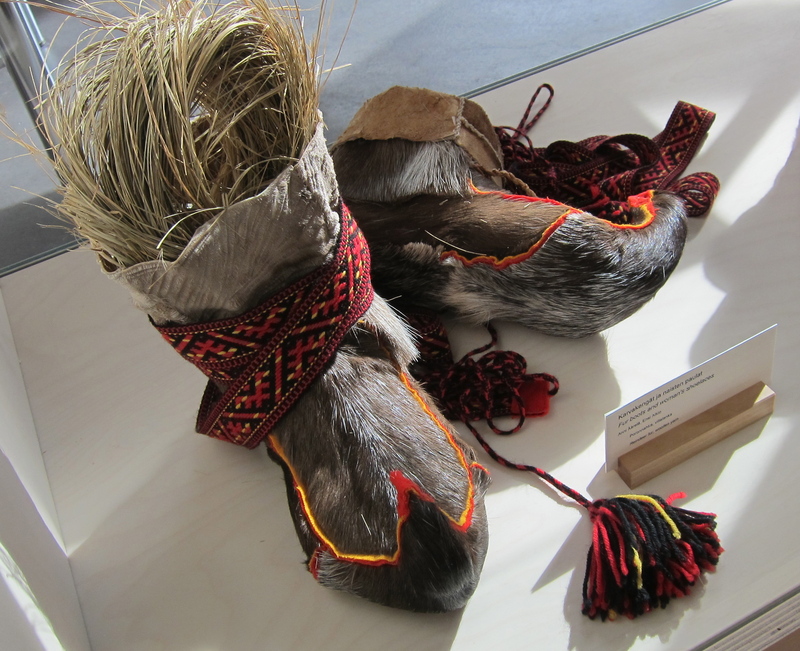 why the Sámi shoes are short and with a hook while the Nenets ones are leg-long without hook. There is certainly much more than environmental determinism in this design-solution. How would you explain such diversity? 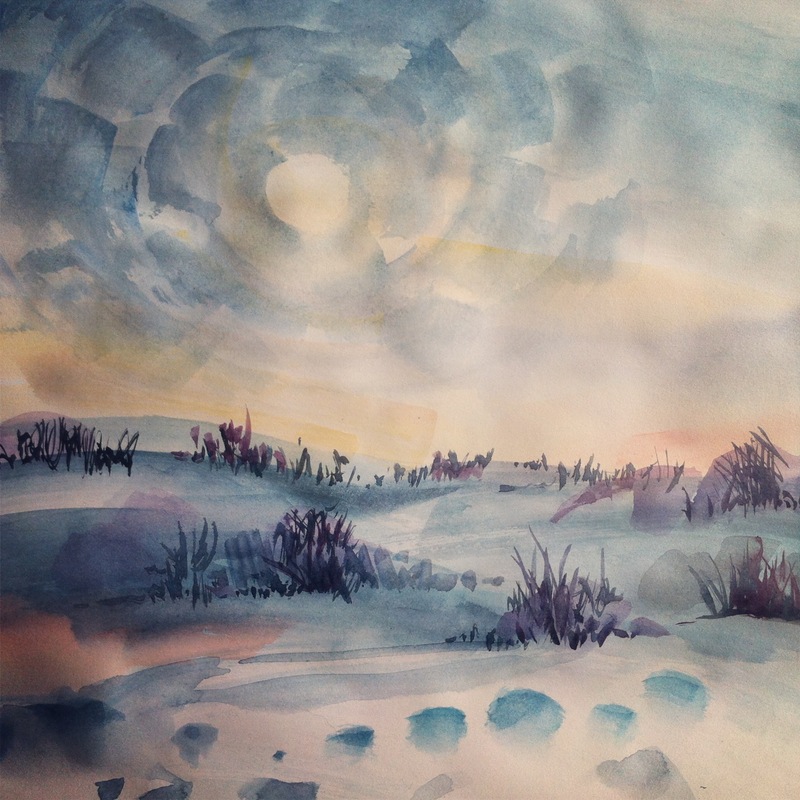 Just marvelous water-colour works. I am amazed how beautiful they are. Since I have drawn in water colours myself years ago, I do now how hard it can be – at least for me. When it comes to reindeer herding did that type of livelihood emerge amongst Sámi in what is now called the Barents region during the second half of the 16th century – first it emerged in what is now the northern Sweden. Before that did Sámi live by fishing, hunting – wild reindeer, elks and such animals – and gathering – berries, roots etc. 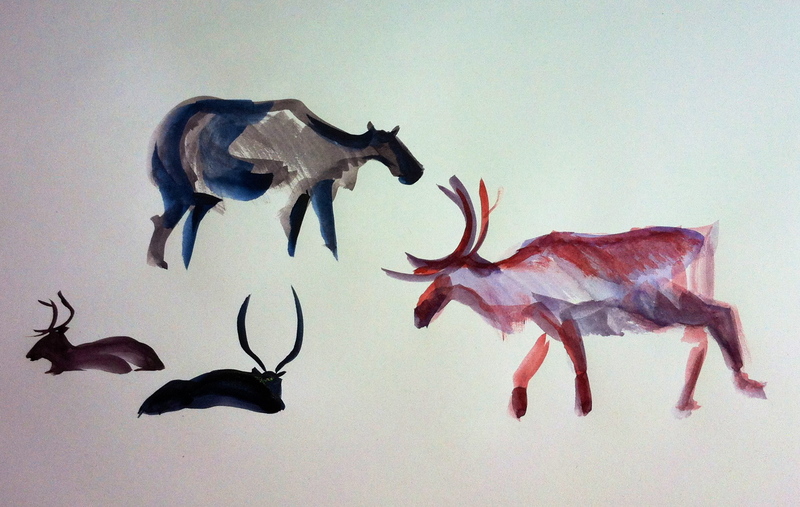 Sámi had domesticated reindeer, but just as decoy-animals when hunting for wild reindeer. The change of livelihood from hunter-gatherer society to reindeer herding amongst the Sámi was a combination of several factors: declining numbers of wild reindeer, state tax outcome in fish and animal meat that were basic food for the Sámi, and an increasing Sámi population that could not solely be fed on what a hunter-gatherer society could provide. If you read Swedish and/or Norwegian you can find some more on that topic if interested in Lars Ivar Hansen’s and Bjørnar Olsen’s “Samenes historie fram til 1750” and Lennart Lundmark’s “Uppbörd, utarmning, utveckling. Det samiska fångstsamhällets övergång från rennomadism i Lule lappmark”, or (try to) search for if they have written anything in English on Norwegian on-line library system Bibsys and Swedish Libris. Lundmark’s book have a short summary in English. Hope you will enjoy it.